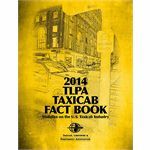 The 2014 Taxicab Fact Book provides important general information about the taxicab industry. Data reporting taxicab fleet operations information, use of computers, credit card processing and usage, and airport service is just a part of the information contained in the factbook. This information provides general benchmarks by which operators can compare their operating data with national averages, thereby identifying company strengths and weaknesses. The Taxicab Rate Sheet is the most popular and widely used portion of the Fact Book. Operators use the rate sheet to compare the base fares charged in their community to base fares in localities of similar size to justify the need for a rate increase.